Knowing how to get testimonials from your happy clients is essential for your photography marketing. But, a lot of photographers struggle with this and have a hard time asking clients to give them a testimonial. However, it's a lot easier to do than you might imagine, and getting glowing testimonials from your best photography customers is not that difficult. 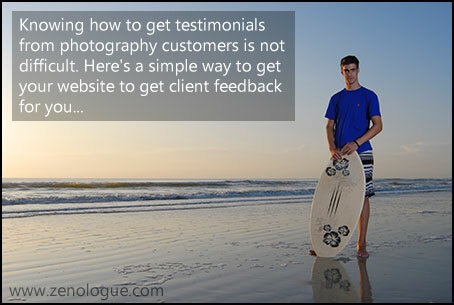 Here's a simple way to use the power of your photography website to get great client feedback. I have to admit, when I first started my photography business, the last thing I thought about was how to get testimonials from customers. A bit of a shame because those testimonials could have helped my business take off a lot faster than it did! Perhaps like most photographers do in the first year or two, I was so concerned with chasing new clients through traditional marketing and advertising methods, trying to get to grips with search engine optimization (SEO) and social media marketing, that I overlooked the amazing potential of displaying glowing testimonials from existing clients on the website as a means to improve my marketing. As hard as it is to own up to the mistake, I wish I’d started collecting testimonials much sooner! But what about you? Are you making the same mistake I did? Are YOU collecting testimonials from your photography clients, and putting them to good use in your marketing? What’s Stopping You From Collecting Testimonials? The (irrational, but nonetheless real) fear that asking clients for a testimonial will unintentionally set them off on a rant about how bad the experience was! Of course, if they really did have such a poor time working with you, they’re more very likely to have complained without being asked first, right? With that out of the way, that doesn’t leave many other excuses for not collecting client testimonials, does it? After all, we need proper feedback from our clients to understand how well we’re doing. We can’t learn without it, making the task of improving our business even harder. By feedback, I don’t mean a simple comment from the customer when you hand over the prints (for example, “I love these”, “these are awesome”). Instead, I mean using a systematized approach to gathering substantial information and in-depth feedback that can tell you how well you’re doing, and allows the clients to say what they really feel without worrying about upsetting you or hurting your feelings in any way. If at all possible, testimonials should also talk about some of your unique selling points from the perspective of how they benefit the client. XYZ Photography was an absolute pleasure to deal with! My three young children are always very quiet and shy in strange surroundings, but the photographer did something we really didn’t expect – she drove all the way out to our home to create the portraits on their home turf. We’re so thrilled with the finished results! So, if you’ve shied away from doing this, or you’re unsure how to get testimonials because you feel your clients won’t respond or, worse still, that they’ll just complain, then you need to get over it and understand that if you’re unaware that a problem exists, you can’t hope to fix it. Testimonials have gotten something of a bad reputation in certain circles over the years, both from being “hyped” in infomercials and also from those cases where unscrupulous business owners have made up their own testimonials and attributed them to obviously fake people. Of course, I don’t advocate hype or being fake, and every testimonial you use in your photography marketing should be a true representation of how the client actually feels about your work, even if you wrote it for them and then had them approve your use of it. Rather than telling people how great you are, use testimonials from clients of yours who love what you created for them. Let them tell your prospects how good you are. Use them everywhere – never use a photo for anything without having a testimonial from that client saying how thrilled they are with what you did, how they are enjoying their photographs, and how they highly recommend you if they want something truly emotional and special. So how do you go about getting this valuable feedback? You could, of course, call your clients on the phone, or email them, which is better than doing nothing, but it’s not very consistent or organized, and the information can be difficult to collect and store. It’s also easy to procrastinate and put off calling or emailing someone if you feel in the least bit apprehensive. This is where your website comes to the rescue. All you need is a single page with a form your clients can fill out at their leisure, that sends you an email with the captured data together with an appropriate “thank-you” email to the client. You can either code the form yourself, or have your webmaster do it for you, but my favorite method by far is to use the amazing Gravity Forms plugin if your website is powered by WordPress. 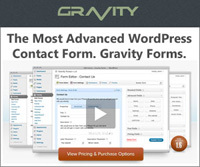 The Gravity Forms WordPress plugin is one I would never be without! You can easily and quickly create beautiful forms for your website and blog in just a few minutes, with no programming knowledge whatsoever. Try it out - I promise you'll wonder how you ever managed without it! You can see a sample form here, created in less than 10 minutes using Gravity Forms. When the user completes the form, an email is automatically sent to the photographer with the responses, and another one is sent to the client to thank them for their time, together with a gift certificate they can use at a later date. Now we have a glowing testimonial from the client, some great intelligence we can use to improve the business, and a potential repeat customer! It really doesn’t get much better than that, does it? The sky’s the limit here, and you can ask almost anything you want. Unlike email sign-up forms, don’t be afraid of asking too many questions. As long as the answers can be simplified and the form can be completed in about 5 minutes, you should be okay. Are they a fan of your Facebook page? What was the major factor for the answer to the above? Would they recommend you to friends and family? Would they like to receive your regular newsletter? I’m sure you can think of others to add to the list, but these are the fields I’ve included on the sample form here, and I’ve found that it works very well. For questions with multiple answers, use radio buttons. Text boxes are great for extended responses (testimonial, comments etc.). Otherwise, simple text entry fields work just fine. I promise that you’ll be surprised at some of the responses you receive, and be emotionally touched by the amazing things people say about you and your work. It’s hard to think of a better confidence booster right now than knowing that someone out there truly values and loves what you do. My observation so far is that clients are more likely to be honest when they’re typing their answers into a website form than they might be if you talked to them on the phone or in person. I get most of my client testimonials this way, and they seem much more genuine than any testimonials we could possibly write for them. By the way, if we do write testimonials for our clients, we have them approve its use every time, no exceptions. Never use a testimonial that a client hasn’t agreed to, if they didn’t write it themselves! This system is fun to use, and it’s a great morale booster when you get the results and see how much your clients really do appreciate you and your work. Just because they’re not burning up your phone to tell you in person, doesn’t mean they aren’t thrilled. It also helps to strengthen feelings of trust in your clients towards your brand. By demonstrating that you care about them and their experience with you, their sense of loyalty towards you can be multiplied many times over, and they’re much more likely to refer you to their friends and family. What Do We Do With The Unhappy Ones? On those very rare occasions when someone isn’t 100% happy with the way things went, then take the opportunity to learn as much as you can from the lesson,. Whatever you do, don’t take what they have to say personally, and do work hard to fix the problem, if at all possible. Call the client on the phone (don’t be tempted to take the easy way out and email them) to explain how useful their feedback was, that you understand their feelings, and to thank them for responding. Offer to do something that would make them feel better about you and your services. Under no circumstances would I advise calling them up to argue the point or attempt to justify the problem. If you behave in a professional manner and treat your clients with kindness (yes, even when you think they’re being unreasonable), this will set you apart from your competition by miles! You might even want to step away from it for a short time (not too long) just to let the dust settle in your mind. I’m sure you can recall more than one bad experience with a company or service where they’ve asked for your feedback and you really let them have it! But – how many of those companies took the time to personally call you to thank you for helping them to improve and to ask for the opportunity to give them another go?How would you feel if they did, and how might it affect how you felt about them? Go Get Some Testimonials Of Your Own! My advice to you is very simple: Arm yourself with the awesome Gravity Forms plugin (if you use WordPress to manage your website or blog) and just do it. It’s easy to set up, straightforward to implement, and the results will speak for themselves.